10 Comments on Updates for Office are ready to be applied, but are blocked by one or more apps. The problem is when the Update Now button is clicked, you get a notice saying you’re up to date! Restarting the program will bring the error message back again. I haven’t found a good solution for this problem yet, any ideas? I’ll update this post if I find something. I get exactly the same thing and have not been able to solve it. Same here and a nuisance as windows 8 is to me in general. I am NOT happy with the changes in respect to Windows XP. Mybe Windows 8.1 might give a solution? Same here since this morning. What on earth are you doing to us Microsoft? I’ve had the same problem for a few days now on my Surface Pro 2 running windows 8.1. I have considered reinstalling or running the repair office program. It seems this is a new bug. I even switched off my firewall to see if that was blocking updates being applied. No luck there. My guess is it is yet another bug we have to deal with…. sigh…. clearly “its not all up to date” as per the display message as such its a bug and in microsoft’s validation code, – more worrying for me is that it shows poor testing. I’m having the same “updates for office are ready to be applied, but are blocked by one or more apps” problem, but this is on an Asus with Windows 8.1 and Office Home & Student fully paid-for, not Office 365. I’m on a mobile connection, so very reluctant to try uninstalling and reinstalling with no guarantee that it will fix it. 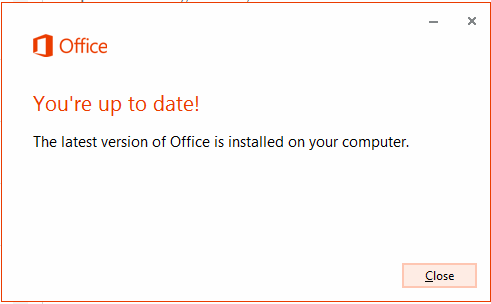 Same issue every time any office product is opened since the update was installed…. Very poor QA/QC on Microsoft’s part. I am not willing to uninstall and re-install as I have no assurances this will be allowed, or that it will fix the problem. Microsoft should fix this and issue another UPDATE that fixes the prior one.